Tinnitus is the sensation of a ringing, roaring, clicking or buzzing sound in the ears even though no such external noise is present. It is usually intermittent. A common cause of persistent tinnitus is chronic (long-term) exposure to loud noises. Tinnitus may also be caused by almost any abnormal ear condition or infection. Some cases are idiopathic, which means the underlying cause is not known or understood. Tinnitus is usually a symptom of an underlying problem. Always read your MSDS's so you know if tinnitus is a possible symptom of exposure to that chemical and take the appropriate precautions. Examples of MSDS's that warn of tinnitus as possible symptoms of (over)exposure (along with other symptoms) include carbon dioxide, the anti-cancer drug cis-platin, and lithium bromide, to name a few. If your workplace or occupation involves loud noises, you should always wear some sort of ear protection. Long-term exposure to even moderate noises can result in lasting hearing loss. Ringing in the Ears (Tinnitus) at Yahoo! Health. Tinnitus (Ringing and Other Ear Noise) at MedicineNet.com. Tinnitus: Causes and Treatment at entropy.brneurosci.org. 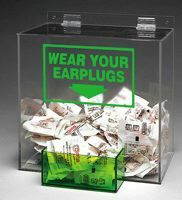 Ear plug dispensers are just one kind of PPE dispenser available from Safety Emporium.